You need to achieve a high score on your postal exam in order to land a job at the post office. No matter which postal exam you are going to be taking, we recommend that you prepare by using study guides and practice tests. There are many postal exam study aids available (both free and paid). The best postal exam study guides will show you how the actual test will look like and get you used to the test format. The ones listed below represent some of the more popular products on the market. TIP: You can also try free postal exam practice tests, like the ones available at test-guide.com. To insure that you score your highest on the exam, please make sure to check out our study tips at the bottom of the page! 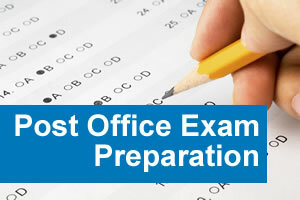 Practice tests are the best way to prepare for your upcoming postal exam. Here is our list of recommended postal exam practice tests. Test-Guide.com Free – Includes comprehensive online practice tests…all for free! Hundreds of practice questions and immediate scoring. Highly recommended. aceyourpostalexam.com – online provider of practice postal exams. mailquiz.com – online postal exam preparation tools. postalexam.com – provides books for postal exam preparation. Check the table below to choose which product will be the best for your particular situation. Postal Exam 473 – The most widely given exam. Required for mail processing clerks, cuty carriers, mail handlers and other delivery/distribution postal workers. Postal Exam 916 – Custodial maintenance exam for postal custodians. It is very important to score well on your postal exam. Your score determines your eligibility for your desired job. TIP: If you pass your exam, your name will be placed on your job’s hiring register – in order from highest score to lowest score (including any points for Veterans’ Preference). Eat a nutritious (yet light) meal – You need to have adequate energy to do well on the exam. Make sure you eat a light meal before the exam…even if you are nervous! Plan how to get to the test site – Make sure you know how long it will take to get to the test site, especially at the same time as the test will be given. Insure you know the directions, where to park, or how to get there by public transit. It makes sense to do a “practice run” to insure you know how to get there. Pace yourself – Many of the exams are timed. Before you take the actual test, figure out how much time you have to spend on each question so that you can keep a good pace. Practice tests will help.